By popular demand, Oracle reviews have returned. I'm moving on to The Dark. Presumably as I get into later and later sets, there will be fewer and fewer cards to review, but I've done cursory scans up to Mirage so far, and the notable Oracle texts are still flowing. Today, I'm featuring two cards that remove creatures from graveyards. 0: If Eater of the Dead is tapped, exile target creature card from a graveyard and untap Eater of the Dead. "If Eater of the Dead is tapped" is a phrase that appears to come out of nowhere. Let's remember Serra Angel and Maze of Ith, though. You can find my recounting of it in my review of Mishra's War Machine. 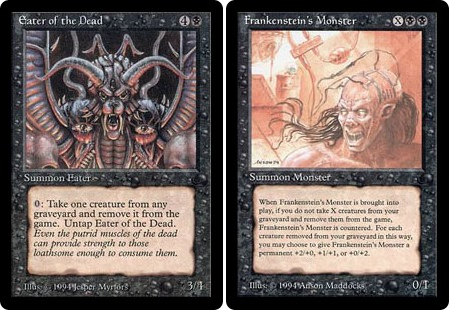 When Eater of the Dead was printed, the rules team could rely on "you can't untap things that are untapped" as a shortcut to avoid spelling certain things out, much in the way that they have relied on spells with no targets being countered for most of Magic's history. Really, they never intended Eater of the Dead to be able to hit the table and immediately devour all creatures in both graveyards. But they never intended a lot of things. I don't think they ever intended people to tap Basalt Monolith to get the mana to untap itself. I don't think they ever intended for people to use Galvanic Key on Time Vault. At some point they had elaborate power-level errata to remove these kinds of abuses, but it's been a long time now since power-level errata was stripped from cards, and they've settled on a "who cares, it's vintage" approach instead. Eater of the Dead existed during the transition from the vague trying-to-untap-something-that's-untapped-nullifies-the-entire-effect rules and the much more sensible trying-to-untap-something-that's-untapped-just-doesn't-do-anything rules. As a result, it was issued official errata clarifying that you can only use it to remove cards from the graveyard if it is actually tapped. Might I suggest replacing this with a "who cares, literally no one will ever play with this card" approach? At 4B for a 3/4 no one could possibly argue that Eater of the Dead is problematic if it can remove an number of creatures from graveyards. At 4B playable only in Vintage and Legacy, I don't even think anyone could argue it would be problematic if we interpreted the original wording as a "choose" instead of a "target" and allowed the Eater to untap any time for free. Is someone really going to make an Eater of the Dead / Fire Whip deck in a format where someone can draw a Kozilek's Inquisition and still die on their second turn? 0: Exile target creature card from a graveyard. Untap Eater of the Dead. I'm more disappointed than I should be. Replace remove-from-the-game with exile, use counters to keep track of permanent stat changes, and you have a nearly unchanged wording, which is kind of impressive, but it's only nearly unchanged, because the original wording had problems. When you bring the card into play, you do a thing, but if you don't do it, you counter the card. You can't counter a creature that is already in play, though. By the time it checks whether to counter the spell, the spell can't be countered. Clearly there are two ways to fix this problem. The first is to sacrifice the monster instead of countering it if the creatures can't be removed. The second is to have the creature be removed as it enters the battlefield instead of when it entered the battlefield. I think it's kind of an open question which makes more sense. I do side with the approach taken by the rules team's choice as the monster was never intended to be in play as a 0/1, vulnerable to Gut Shots and such before taking on its larger size. I'd accept either decision, however. So what's the difference, you may ask. Countering a spell means putting it in your graveyard, that's just what happens to insufficiently fed Frankie. The only difference I can come up with is having Baral or a Lullmage Mentor in play. If you cast a Frankenstein's Monster with X higher than the number of creatures in your graveyard, then it would be the ability of the Frankenstein's Monster that countered itself, that would be an ability you controlled, and so you could use it to loot or to create a merfolk token.